Cold winter weather strikes us every year and with it, comes a list of necessities we need to survive the season. Among those must have products, is a sturdy jacket that will last year after year. There are a lot of different winter wear products on the market that guarantee protection from the snow and cold, but few stand up to their promises. Many times, we run into problems with our outerwear in the winter. It may be too bulky, too thin, or just downright unfashionable. We strive to find a product that fits us well, lets us move, and is eye-catching and flattering. 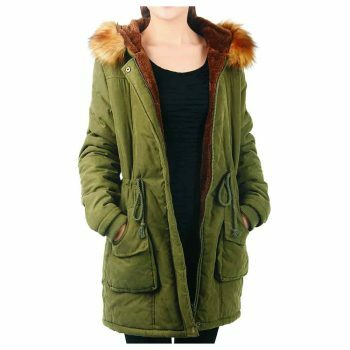 Finding the best womens parka is the best place to start. The parka stands out among the other options for outerwear in the winter. It is typically large, resistant to the wind, hooded, and may contain many pockets or fur trim. It is essential for climates with extreme cold, but can protect you from wind, rain, or snow in any region. One of the biggest factors that comes into play when purchasing a winter parka is budget. There are a lot of different options on the market to choose from so it is important to understand exactly what features are “must haves” and make your purchase worth your dollar. Let’s take a closer look at what you need to keep in mind when purchasing your parka this winter. What features should you look for in your parka? The main purpose of a parka is protection from the cold, but did you know that there a variety of ways that can be achieved? No two jackets are the same, and while price point is one factor that can make the difference, the features of the jacket can play a large role in how warm you will stay this winter. The shell of the parka is the outermost layer. Shells are available in a variety of materials including 100% polyester, or polyester / cotton blends. Look for the most “breathable” fabric option in your price point. The most important feature you can look for in a shell is water resistance. The shell should repel any water and dry quickly to protect the interior lining of the coat and keep you warm. Likewise, shell options that are wind resistant will undoubtedly keep you warmer too. The lining of the parka is the innermost layer that covers your clothing. There are various options when it comes to lining including down, synthetic, or natural or faux fur. When selecting the liner you would like to have, remember that not all materials will be machine washable, and high quality fabrics may be dry clean only options. Down. Down is a popular option when it comes to parka linings. Down is typically made of the feathers from a goose and provides a lightweight, breathable interior for your jacket. Down is known for keeping you exceptionally warm in the winter months, and is generally recognized as one of the highest quality insulating materials for winter wear. Fur. Natural animal fur, or manmade “faux” fur is another option for an internal parka lining. Natural furs come at a hefty price tag, but many synthetic faux fur options are available on the market. Fur material will be exceptionally soft and will insulate the body well. Fur is a great option for very cold climates. Synthetic. A more affordable option is a synthetic material lining. These materials are made in a factory and mimic the warm insulation that down feathers or animal fur would provide. Like the shell of your parka, synthetic materials are made to dry quickly and withstand extreme cold temperatures. Popular options include nylon and polyester. While parkas are designed with the primary goal of keeping you warm in winter weather, they are not without a variety of fashion options that are beneficial for the wearer. Hoods. Hoods provide great protection against the cold, especially in areas where high winds can easily result in frostbite. Many parka hoods are lined with fur or faux fur, which provide an extra layer of wind resistance around the face. Some hood options are removable, which is helpful if the winter climate varies in your area. Adjustable hood options are especially effective in very windy areas, as they are often equipped with a drawstring that pulls the material more tightly around the face. Pockets. Parkas are made with a variety of pocket options. Those which include deep pockets are great for transporting many of your everyday items such as phone, car keys, or wallet. Some of these options zip close for added protection of your valuables. Snaps/Zipper. Most parkas secure closed with snap buttons or zippers. This feature is mostly one of personal preference. Either option will keep you warm, but it is important to look for a parka which has the closure mechanism all the way to the top of the coat. Anything which exposes the neck or chest to colder temperatures will not be as effective at keeping you warm. Other. Some parkas are equipped with various nonessential features that combine personal preference and increased versatility. Headphone channels, wire inserts, fur cuffs, or additional adjustable exterior straps can all improve the fit and function depending on your daily needs. Fit is one of the most important features when it comes to selecting your winter parka. An appropriate fit ensures adequate warmth and fashion in these garments. Select a style that is appropriate for your body size, including one that fits properly throughout the length of the arms. Keep in mind you will likely be wearing this jacket over various layers of clothing, so it may be wise to try on the parka with an outfit that is appropriate for cold weather. While you want to the jacket to be somewhat fitted to the body for proper insulation, it is helpful to zip or button the jacket completely and bend and reach to mimic everyday movements. Make sure the parka doesn’t expose any part of the arms, torso, or neck and that movement is not restricted in any way. Patagonia’s Tres Down 3-in-1 Parka is ideal when it comes to versatility within a parka. Patagonia is known for their high-quality ski jackets, which provide high water resistance, and the 3-in-1 parka is made from the very same material. Whether rain or snow, this jacket will ensure protection from the elements. An added bonus of the Tres Down 3-in-1 is the removable liner. This method of construction allows you to customize the coat to the weather. Removing the inner lining allows you to create a product that is perfect for light summer rains. The liner itself is treated with DWR, ensuring high water resistance even without the shell. The removable liner is also great for insulation, as it is made with Traceable Down. For those consumers who are conscious about animal treatment in fashion, this liner is made with down from birds who have never been force fed or live-plucked. Beyond versatility and ethics, the Patagonia Tres Down 3-in-1 parka is a fashion forward option. The slim, tapered cut compliments the natural outline, and the above-knee length keeps everyday movements free. For those looking for a great looking parka that can serve them year-round, this jacket is made just for you! The Canada Goose Parka is the ideal option for extreme weather temperatures. Duck down and coyote fur combine to form a high quality protection and insulation, even in below freezing temperatures. Pockets and plackets are numerous, allowing easy transportation of valuables in cold climates. The adjustable straps allow for a more customizable fit, and the removable coyote fur that lines the hood is a versatile benefit that shields the wearer from high winds. 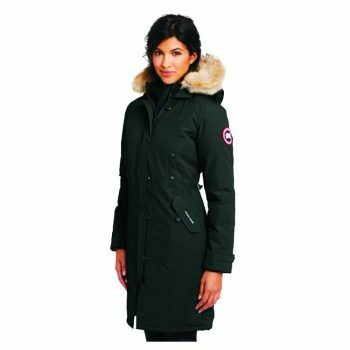 Although thick to protect from the elements, the Canada Goose Women’s Kensington Parka is a fashionable option that flatters the body. The various snaps and pockets are placed in a chic manner, while also providing the most functionality. If you are looking for a parka that provides warmth in extreme conditions, yet is flattering and practical, this parka is your best bet. The Arc’teryx Patera Parka is a lightweight, fashionable parka that helps control body temperature and uses superior technology to help you stay warm and dry. The shell is designed with a Gore-Tex outer layer which provides maximum water resistance and wind resistance. Coreloft is Arc’teryx’s synthetic insulation which is highly renowned for its lightweight construction. With the combined technologies of Gore-Tex and Coreloft you can be certain you will stay dry and warm all winter long. 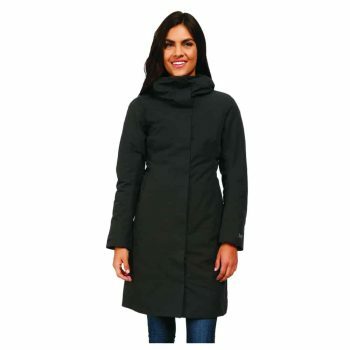 The Arc’tyerx Patera Parka is favored by women due to its reduced bulk in the underarm region and along the sides. Although well-insulated, this jacket achieves a slimming profile, and the sleek design helps improve range of motion while being practical and stylish. This jacket is favored because it provides all over coverage without overwhelming the wearer. The draw cords and storm collar provide extra warmth around the face and neck, and the two insulated hand pockets are great for those trips where you find yourself without gloves. The internal passport-sized pocket is perfect for storing small valuables safely, and makes this parka perfect for travel. 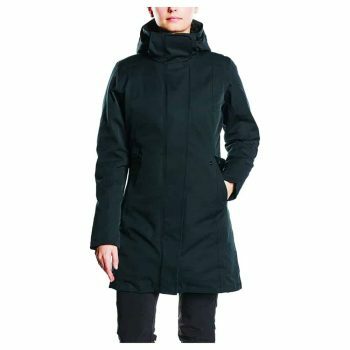 If you need a parka that is lightweight, provides full coverage, and is fashionable, the Arc’teryx Women’s Patera Parka is waiting for you. The Patagonia Downtown Parka is a great option for those who want a slim style jacket that is effective at keeping wearer warm. The DWR finish provides maximum wind and water resistance, and 600-fill down insulation traps warmth easily. While many parkas are bulky in appearance, the Patagonia Downtown Parka is renowned for its slim fit. 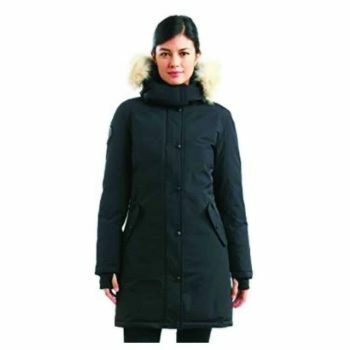 While following the natural body line well, this parka also is noted for its high collar and long length ensuring full-body coverage from the cold. The zippers are favored for carrying cash and credit cards, and the inside chest pocket is practical and blends nicely against the inside of the coat. This parka is no-nonsense, and is a great option for someone looking for a jacket that provides warmth and good range of motion without a lot of excess features. The Triple F.A.T. Goose Alistar Parka is a high performance and luxurious option for those who will be battling tough winter weather. Insulation is made of premium white goose down which yields maximum warmth and unmatched comfort. Authentic coyote fur lining is detachable and complete with a hidden adjustable wire insert that allows the wearer to customize the fit around the face to block out even more cold. The DWR outer layer is coated with a Teflon Shield + Fabric Protector technology that prevents staining and easily repels water. Storm cuffs provide added warmth to the hands and convenient pockets provide easy access storage. Although complete with a flattering tapered fit, the manufacturer does recommend ordering one size up. This jacket combines high quality materials and premium technologies to achieve unmatched warmth. This parka is perfect for the fashion-savvy individual who is looking for luxury and performance. The Meaneor Parka is a practical and traditional parka. The faux fur lining and trim is designed to keep out high winds and provides all-out warmth without needing to utilize genuine animal fur. Although synthetic, the fur is exceptionally soft and comfortable and constructed with a high quality. This parka is highly favored for its deep pockets. Ideal for storing gloves, this jacket also provides enough movement to partner with a scarf or layered outfit allowing you to complete your winter wear with ease. The drawstring is another highly-favored feature, as it allows a more customized fit in the lightweight design. This parka is among the more traditional and straight forward options. 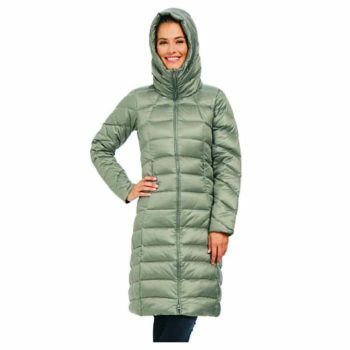 Women appreciate the versatility of this jacket when it comes to pairing with a variety of different winter outfits, and features like the attached hood and zipper and snap closure system create a practical, yet cozy parka. If you are looking for a traditional, comfortable, and straightforward option, the Meaneor Faux Fur Lined Parka may be just what you need! Now that you have seen what is available among top-quality parkas you can easily make an informed decision about which option will serve you the best this winter. There are a lot of different choices on the market, and even more price points you can shop in. It is important to understand exactly what your dollar can get you when it comes to efficiency, comfort, and features. Hopefully at this point, you feel you have enough information to choose one that is exactly right for you. Did you feel this guide helped you choose the right parka this winter? What do you find the best feature of a parka to be? Let us know in the comments! With more cold temperatures still on the way, be sure to share this guide with your friends and family so we can all stay warm this winter!